"This pie is best with the big, locally grown raspberries you pick yourself. In a pinch, you can make it with frozen." Heat 1 cup raspberries and 1/2 cup water in a saucepan over medium heat; cook and stir until raspberries soften, about 5 minutes. 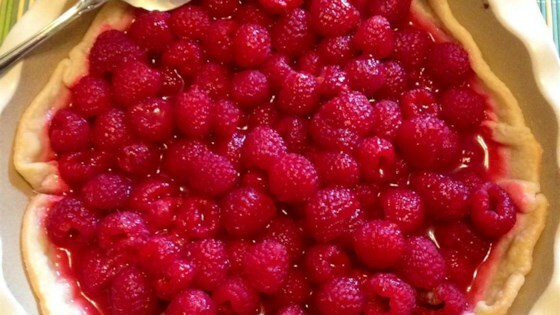 Strain raspberries into a bowl through a fine mesh sieve; discard seeds. Return mashed berries to the saucepan. Stir cornstarch and 1/4 cup cold water in a bowl until dissolved and stir into mashed berries; add sugar. Heat raspberry mixture over medium heat, stirring constantly, until thickened, about 5 minutes. Stir in lemon juice. Allow raspberry sauce to cool to room temperature. Line the prepared pie crust with remaining 3 cups raspberries. Pour raspberry sauce over berries and chill until set. Serve garnished with whipped cream and lemon zest. Made this pie with my homemade crust recipe and fresh picked raspberries. Made according to directions and turned out perfectly. Delicious and fresh, family LOVED it!!! 1/3 cup sugar. Chocolate Graham crust. Really good recipe. I made it with an easy crust recipe from Allrecipes and it worked out well. I used 1/3 cup sugar rather than 1/2 cup sugar. Absolutely delicious pie! Everyone loves it! I have shared it with friends and they all love it!